Feeling a little nostalgic today. 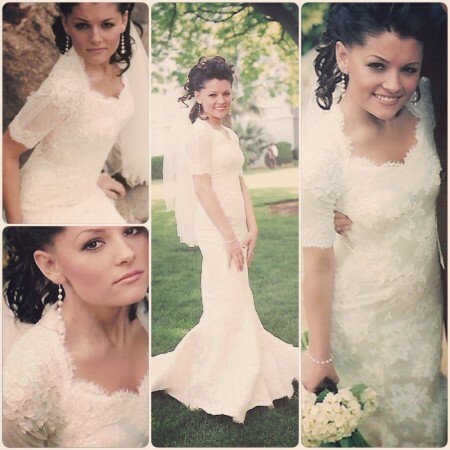 Eight years ago on this day was the wedding of my first custom bridal client, my beautiful sister! After her wedding my mother received phone calls inquiring where my sister had bought her gown. This was my first insight to the need for beautiful modest wedding gowns. I decided to go with it; I designed several other gowns for friends and family members. The response from these first gowns spoke volumes for the need of stylish wedding gowns that maintain a high level of quality and modesty. Ultimately this led me to start Illume. After graduating with my degree in Fashion Design I wondered what my niche would be. I worked designing exercise/dance wear, designing custom home decor and teaching sewing/pattern making. Bridal was not on my radar until my sister got engaged. This one experience changed my path. It gave me a glimpse into the potential that high quality modest bridal could have. I am grateful for work that is purposeful and that I am passionate about. I love offering women options that reaffirm my belief that you don’t have to compromise modesty to dress modern & stylish! Amazing that dress is 8 years old and totally stands the test of time! Classic and beautiful, I would see this on a bride today. I love design that can be worn in any decade and you’d never know. You do such beautiful, detailed work! Oh the world needs more designers like you.